Mary, how do you call her Blessed? How do you call Mary Blessed? If you don't call Mary blessed, you are not following the Bible, but your tradition that is at odds with your Bible! Any and all attempts to explain Mary away using the Bible will fail because the Bible does not explain Mary away. The Bible explains who she is and what she is about in relation to Jesus. (and you [Mary] yourself a sword will pierce) so that the thoughts of many hearts may be revealed (Lk 2:35). All attempts to put Mary at odds with Jesus will also fail because Mary is not at odds with God; she in fact proclaims the greatness of the Lord. And Mary said: "My soul proclaims the greatness of the Lord; my spirit rejoices in God my savior" (Lk.1:46). In the photo on the left, I do not know the child or the family; however, this is my all time favorite photo that has been posted over the years on Facebook. People were bringing little children to him in order that he might touch them; and the disciples spoke sternly to them. But when Jesus saw this, he was indignant and said to them, “Let the little children come to me; do not stop them; for it is to such as these that the kingdom of God belongs. Truly I tell you, whoever does not receive the kingdom of God as a little child will never enter it” (Mk 10: 13:15). We call Mary blessed every time we say the prayer, the "Hail Mary." In the prayer there is a part that relates specifically to Mary. It says, Blessed art thou among women. I was in a conversation with an Evangelical friend and the subject was Mary. I asked her, how she calls Mary Blessed? She told me that calling Mary blessed is idolatry. I pointed out that in the Bible, Mary calls herself blessed. From now on will all ages call me blessed. The Mighty One has done great things for me, and holy is his name” (Lk 1:46). FROM NOW ON WILL ALL AGES WILL CALL ME BLESSED. The Mighty One has done great things for me, and holy is his name” (Lk 1:46). In an attempt to minimize the importance of Mary, another person wrote that Mary was never mentioned by Peter or any of the Apostles. If the Apostles didn't mention Mary, then this person is reasoning that Mary is of no real consequence. However, he left something out and this is the many references to Mary by others, in the Bible, who did mention her. Why did he do this; it is very simple. It has to do with the "Jesus Alone" Protestant understanding. If they were to quote all of the magnificent quotes about Mary, then it is no longer "Jesus Alone." It is Jesus with Mary, the Apostles and prophets, and all of us working together with Jesus for the salvation of souls. Below are some of the people in the Bible, who did mention Mary and honored her. There is one other reason that that some people speak against Mary in favor of Jesus. This is the fact that the Catholic Church speaks very highly of Mary. If the Catholic Church was right on their understandings of Mary, then what's to keep them from becoming Catholic. After all they do know that all of the Protestant Reformers were Catholic. And so they have to claim that the Catholic Church is wrong when the Church holds Mary in such high regard. Martin Luther honors Mary. On the other hand not all Protestants speak against Mary in favor of Jesus. Therefore, I must defend many of my non-Catholic brothers for also having a very high regard for Mary. The Protestant Reformers, especially Martin Luther, spoke of his extremely high regard for Mary. Martin Luther: If our Lady were to enter Jerusalem today, in a golden coach drawn by 4,000 horses it would not be and honor great enough for she who bore in her womb our Savior. (Protestantism and our Lady, Fr George Rutler). The angel Gabriel honored Mary. The angel Gabriel was sent from God to a town of Galilee called Nazareth, to a virgin betrothed to a man named Joseph, of the house of David, and the virgin's name was Mary. And coming to her, he said, 'Hail, favored one! The Lord is with you.' But she was greatly troubled at what was said and pondered what sort of greeting this might be. Then the angel said to her, 'Do not be afraid, Mary, for you have found favor with God. Behold, you will conceive in your womb and bear a son, and you shall name him Jesus.' (Lk 1:26-31). 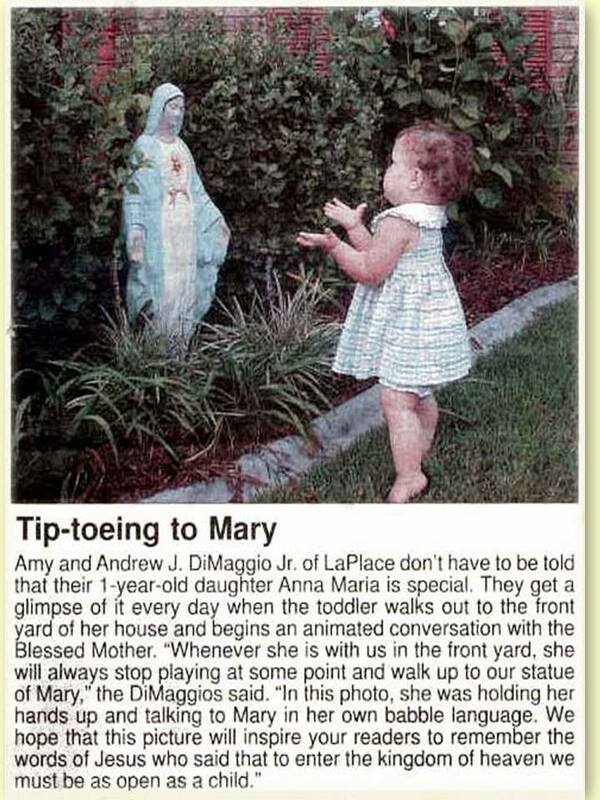 God honors Mary. Mary is to be the Mother of Jesus and has found favor with God. I think we should favor her as well. Mary spoke of the honors given her by God. And Mary said: 'My soul proclaims the greatness of the Lord; my spirit rejoices in God my savior. For he has looked upon his handmaid's lowliness; behold, from now on will all ages call me blessed. The Mighty One has done great things for me, and holy is his name' (Lk 1:46). Look at the honors, God has done great things for Mary and for all ages. Some are afraid that Mary might take away from Jesus. However, God did not share this fear; He honored Mary. Elizabeth honored Mary. When Elizabeth heard Mary’s greeting, the infant leaped in her womb, and Elizabeth, filled with the Holy Spirit, cried out in a loud voice and said, ‘Most blessed are you among women, and blessed is the fruit of your womb. And how does this happen that the mother of my Lord should come to me? For at that moment the sound of your greeting reached my ears, the infant in my womb leaped for joy. Blessed are you who believed that what was spoken to you by the Lord would be fulfilled' (Lk 1:41-45). Elizabeth called her “most blessed” and was honored to have Mary in her presence. Simeon honored Mary. Simeon blessed them and said to MARY his mother, 'Behold, this child is destined for the fall and rise of many in Israel, and to be a sign that will be contradicted (and you [Mary] yourself a sword will pierce) so that the thoughts of many hearts may be revealed' (Lk 2:34-35). A sword pierces Mary’s heart so that the thoughts of many hearts may be revealed. That doesn’t sound like "Jesus alone" to me. Mary had a role as well. Jesus honored His mother Mary and Joseph by obeying them. He [Jesus] went down with them and came to Nazareth, and was obedient to them and his mother kept all these things in her heart (Lk 2:51). He did this in keeping with the fourth commandment of God, Honor your father and mother Ex 20:12. Jesus honors Mary and Joseph, and we do likewise in imitation of Jesus. Jesus honored his Mother at the wedding feast of Cana. He did so by performing His first public miracle at her request. When the wine ran short, the mother of Jesus said to him, ‘They have no wine’(Jn 2:3). Initially Jesus resisted Mary's request, Jesus said to her, 'Woman, what concern is that to you and to me? My hour has not yet come' (Jn 2-4). Mary persisted, Do whatever he tells you (Jn 2-5) and in the end, Jesus turned the water in to wine. Martin Luther, the angel Gabriel, Elizabeth, Simeon and Jesus all honored Mary. Do you honor Mary or do you explain her away and treat her as though she is a competitor of Jesus? Another person asked a most excellent question; What specifically should Christians ask of Mary? It all depends on what the need is. At the wedding feast of Cana the need was for more wine. What is your need? And when you ask Mary to intercede on your behalf, I am sure she will go straight to Jesus with your request. This is what she did when she interceded on behalf of the wedding feast at Cana. Mary’s intercession is in the Bible. If people are to be fully Biblical Christians, Mary must be in some way honored; otherwise parts of their Bible are being rejected for the sake of tradition. Some times, my Evangelical friends will tell me that according to what it says in the Bible, Mary is only a humble handmaid of the Lord, who should not be exalted. To them, only Jesus should be exalted. These Evangelicals are, in part, correct because Mary admits in her own words that she is the humble handmaid of the Lord. For he has looked upon his handmaid's lowliness (Lk 1:46). However, this is precisely why we do exalt her because Mary humbled herself. “Humble yourselves before the Lord and he will exalt you” (Jm 4:10). If God exalts the humble, then Mary in her humility is exalted as well. And we also exalt Mary and others who are humble. Those who claim that "Jesus alone" should be exalted are not following their Bible. Mary’s message yesterday, today and forever, “Do whatever He [Jesus] tells you” (Jn 2:5). As you can see Mary is not in competition with Jesus. So how do you in your church and in your life honor Mary? If you don't honor her, then why do you put your tradition above the Bible?